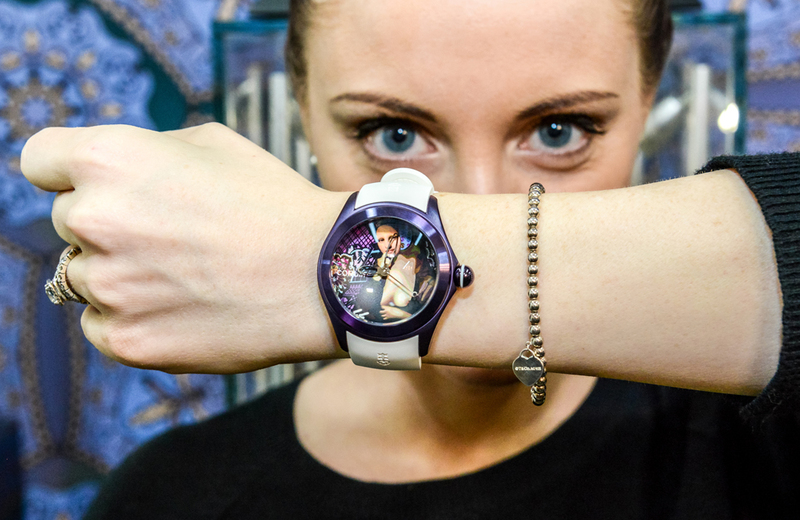 Corum Bubble invites You to Ask: Are Watches your Expression or the Makers? Speak to a modern watch aficionado about Corum and inevitably, the brand’s emblematic model from the 1970s – the Corum Golden Bridge and its high profile creator Vincent Calabrese spring from lips. While it is true that Calabrese deserves all the kudos and recognition, the recent Corum Bubble exhibit at Marina iLight Festival also prompted a thought in my mind – are watches supposed to be your personal expression or the watchmaker’s? Founded in 1955 in La Chaux-de-Fonds, Gaston Ries and his nephew, Renee Bannwart have consistently developed Corum on the guiding principles of creativity and boldness. Sure, many brands claim to creativity but how many brands truly embrace the brass, steel and sapphire canvas of watchmaking? Today, people talk of successful enterprises and entrepreneurship in terms of being able to “pivot” – ability to adjust your business strategy to rapidly changing market conditions; it shouldn’t surprise you to learn that Corum was one of the earliest pioneers of the pivot and they were successful in this high risk maneuver precisely because of the brand’s inherent creativity. 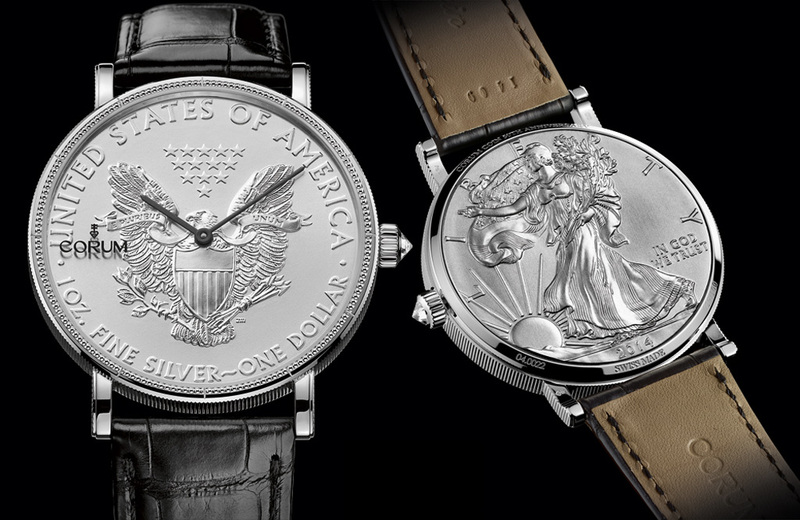 The modern Corum Silver Dollar Coin Watch, it’s historical predecessor stands as a prime example of what it means for a company to “pivot” even before the entrepreneurial term was coined (pardon the pun) in the early 2010s. Over 50 years ago, on the eve of the Basel watch fair, Corum experienced a corporate emergency – their supplier of watch dials had failed to deliver the much needed faces of the watches. When faced with the possibility of failure, Bannwart committed what resources he had to Corum’s pivot – introduction of movements built inside a $20 “Double Eagle” or $10 “Liberty” coin – from the jaws of defeat, Corum found itself an instant best seller. Sure, critics can split hairs and say that pocket watches had used coin dials before and that the idea isn’t original, but the literal fact is right up till then, the coin wristwatch was heretofore unknown and it was Corum which introduced it. According to Alan Ivy, senior specialist for creativity and scenarios at elite business consulting outfit BCG, the key defining problem of creativity is that when someone advises you to try to think outside the box, the premise is the assumption that you already know how the box is defined. When the mental framework with which you’re supposed to surpass has no clearly defined lines, you simply have no idea where to look for new ideas (pardon the pun) beyond that space. The Ford Model T introduced in 1908 was an urban symbol but farmers were removing the back seats of these vehicles to transport agricultural supplies for almost 2 decades before the pick up was invented. 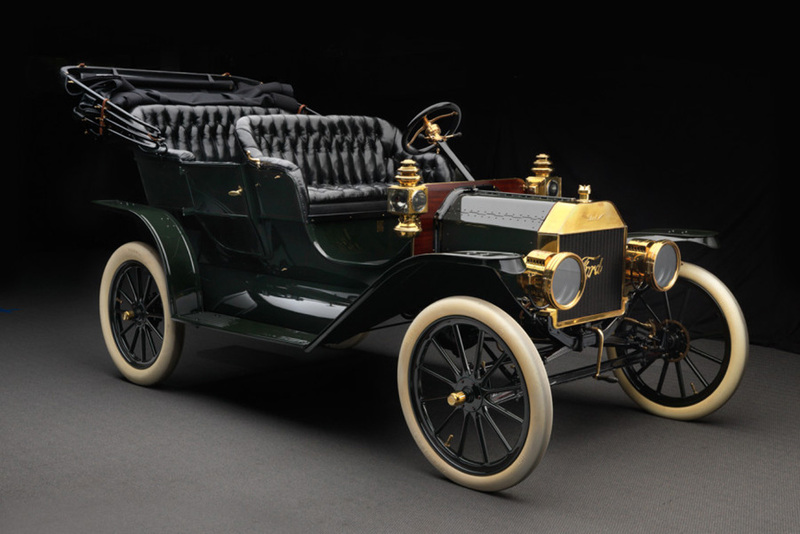 Let’s ponder for a moment, the Model T was produced by the Ford Motor Company in October 1908. Named the most influential car of the 20th century, the Ford Model T was an urban status symbol because it provided inexpensive personal transportation to the masses- it was a symbol for America’s rapid modernisation and rising wealth of the growing middle class. It was highly popular with urbanites but rural agrarian businesses started to adapt the Ford Model T by removing the back seats of the vehicles to make space for tools, hay and other agricultural supplies. It was the lack of doubt at Ford, that the Model T could be anything OTHER than an urban automobile that it took close to 20 years for the pick up truck to be created. Imagine the massive commercial implications had another company thought to invent the pick up truck in that time? Thus, the secret to creativity is “doubt” – for Bannwart, potential disaster forced him to ask the question “why should a watch dial always be a thin disc of metal? Why not a coin?”; For Severin Wunderman, Corum’s then owner in 2000, his act of creativity was prompted by doubt as well, “who says domed crystals should only be on dive watches? (even if it might distort the dial)”; thus, in an act of historical symmetry, something that it too was heretofore unseen was born- the Corum Bubble. The original Corum Bubble launched in 2000 was a 44mm behemoth, long before large watches were in vogue and when combined with a high sapphire crystal dome, the watch magnified the dial and its indexes to playful and fun proportions and as a brand signature, it was impossible to miss. The new series of Corum Bubble watches – the skeletonised version is so attractive that it seems almost like a pity that Wunderman never discovered the idea sooner. For Wunderman, he stated in an early interview that the Corum Bubble was merely a watch canvas for whatever from whoevers’ dreams could conjure. The dials approximated art and more importantly, it was a medium for pleasure and provocation. Sadly, when Wunderman passed in 2008, Corum fell into the trap almost all brands fall into, the one of taking themselves too seriously. Thus, under the auspices of another visionary new Chief Davide Traxler, a man credited with the brand’s first year of growth after a decade long drought, it’s with some excitement that the new Corum Bubble debuts not merely as a facsimile of the original but as a new, larger than life 47mm descendent. Designed with tapered lugs to wrap your wrists in a warm embrace, the 8mm high domed crystal is designed to make your day fun and expressive. Where the Bubble differs from another brand icon, the Golden Bridge is in the execution. One hand, Calabrese’s genius is expressed in a highly engineered strip of gears and pinions. In another, your ideals or that of your cultural hero is celebrated. Steven Hiroyuki “Steve” Aoki is one of the highest grossing dance artists of our time, collaborating with other musical geniuses like will.i.am, Iggy Azalea, Afrojack and LMFAO. The Grammy nominated producer and DJ brings his unique vision to the limited edition Bubble Steve Aoki. You may or may not espouse Aoki’s artistic vision but the talented DJ artist is highly influential cross-genres of our generation. First in a series of timepiece collaborations between Corum and the DJ, Aoki is a regular chart topping DJ and a giant in the electronic dance genre, maker of one of the most defining sounds in modern history. So influential is Aoki that his likeness has been featured in industries where he has no real connection – an admitted terrible basketballer, he’s included as a special celebrity player in NBA 2K9 video game; he even appears in another game, Dragon Ball Xenoverse. The influence of the multi-award winning philanthropist DJ knows no bounds. The exclusive partnership between Corum and Steve Aoki means that his unique aesthetic of haute couture streetwear and blend of casual high fashion means that owners of his special edition Corum Bubble embrace not just his music but his philosophical inclinations as expressed by his choice of design. Conceived on a sketch while in Spanish Ibiza, mecca of dance music, Aoki’s Limited Edition Corum Bubble is fitted with the towering domed sapphire crystal we’ve come to recognise and its 47mm steel case is PVD coated in scratch resistant Prussian-blue. But the raison d’etre of the Corum Bubble exists in a lacquered jet black dial with geometric motifs – three dimensional blocks and cubes with sides in contrast colours, all stamped out of the dial face. The inspiration is clearly Cubist but the execution is thoroughly Aoki – a rave in a watch. 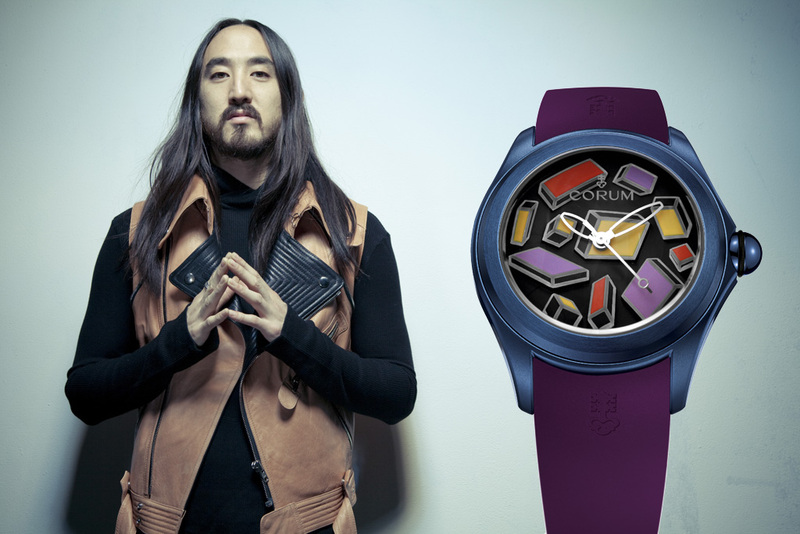 The sapphire case back is tinted and silkscreened with Steve Aoki’s identifiable silhouette – mistakable hair and beard. Fantone is not just a pretty (really pretty) face, she’s also really talented. Her work like Aoki’s, begs you to express your own artistic ideals. And Corum is making that possible. Elisabetta Fantone is a multifaceted Canadian artist, who has been commissioned by celebrities like Muhammad Ali and Celine Dion to create limited edition artworks. For the Corum Bubble, Fantone takes the most iconic portrait in human history and adapts it with a post-modernist aesthetic – the Mona Lisa in a Corum Bubble is likely one of the special confluences in human art history – the cultural revolution of 60s and 70s pop art with the high renaissance. Here’s a unique opportunity to follow the footsteps of talented individuals like Aoki and finally express yourself your artistic vision in your own Corum Bubble rather than simply appropriate a watchmaker’s genius. From now till 31 March 2017, Corum is running an Instagram contest “CUSTOMIZEYOURBUBBLE” for fans in Singapore and Malaysia where you can visit www.customizeyourbubble.com, design your Bubble, post your design on Instagram and stand a chance to win your own Corum Bubble. The La Chaux-de-Fonds maison will present to the creators of the top two designs with the most ‘Likes’ on Instagram with their very own designed Bubble watch. Visitors to the Marina Bay iLight Festival should pop by the Corum Bubble Capsule to not just see the watches, but also have some fun interacting with the light projection inspired by another Bubble collaboration project with Paris-based photographer, Dani Olivier, who specializes in “abstract and psychedelic nudes”, human bodies covered in striations of coloured light.